WHAT HAPPENED: After Syracuse took a 17-13 lead with 10:11 left in the first half after a Tyus Battle 3-pointer, Louisville tightened its defense and took a commanding 41-25 lead into intermission. An Andrew White layup with 9:08 left in the second half cut the lead to 61-50, but that is the closest Syracuse would get. 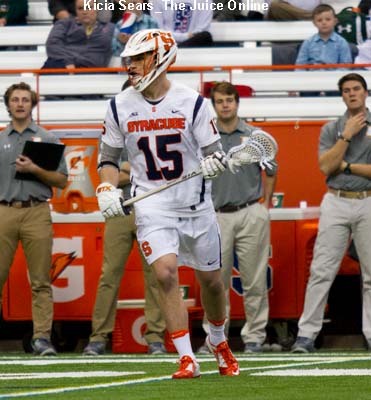 ANALYSIS: While Syracuse may have kept pace with Louisville at the Carrier Dome, the Cardinals completely took it to the Orange on their home turf. Louisville stymied Syracuse all afternoon, holding the Orange to 35.2 percent shooting from the field and 7 for 28 shooting from beyond the arc. Syracuse also committed an uncharacteristic 16 turnovers and was -10 on the boards. 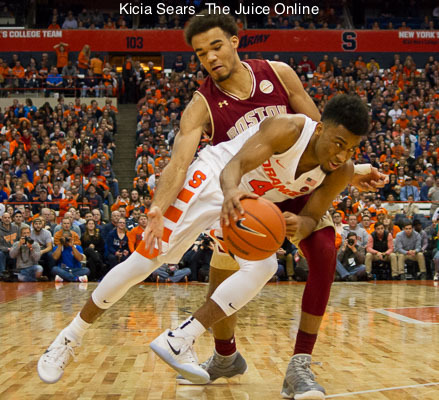 It appears that Syracuse will still need at least one more win to push itself into the NCAA Tournament, with one regular season game left at home against Georgia Tech, and then the ACC Tournament. HERO: Donovan Mitchell had several highlight dunks en route to 25 points on 6-10 shooting from downtown. Tyus Battle finished with 20. ZERO: Andrew White was held scoreless until midway through the second half and finished with 7 points on 1-8 shooting from the field. Tyler Lydon was also cold from downtown, shooting 1-6 from distance. WHAT’S NEXT: Donovan Mitchell had several highlight dunks en route to 25 points on 6-10 shooting from downtown. 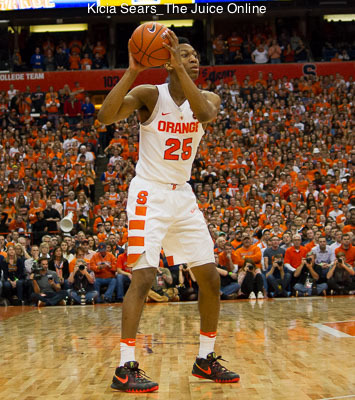 Tyus Battle finished with 20.